The news that came out of the American Astronomical Society meeting this week in Long Beach, Calif. is staggering. The team behind the Kepler space telescope has discovered 461 new exoplanet candidates, bringing the total to 2,740. Latest estimates now show that there may be as many as one planet for every star in the Milky Way -- at least 100 billion planets. Kepler quietly orbits the Sun in roughly the same orbit as Earth, unblinkingly recording the light coming from a particular patch of stars. Astronomers then sift through the data, looking for stars that have regular, predictable dips in their light, indicating an exoplanet might be passing in front of the star. They weed out false positives and make regular announcements of so-called planet candidates. The latest 461 candidates will require independent confirmation from other sources before they become bona fide exoplanets. 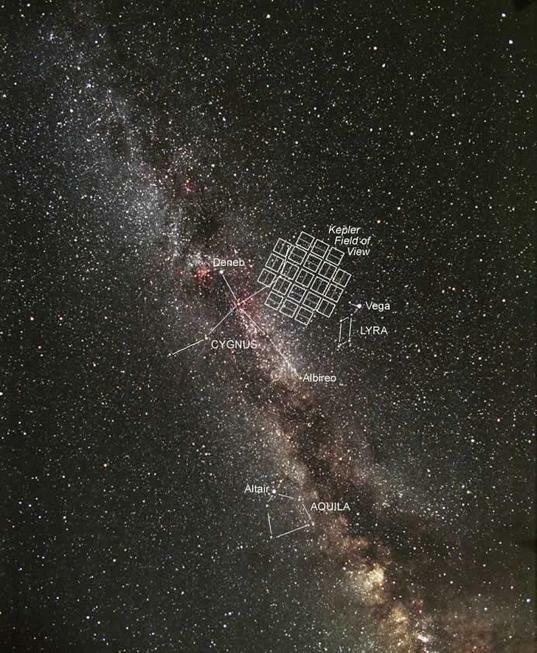 The Kepler space telescope's field of view, facing slightly off-center from the core of the Milky Way. Four of the new candidates sit in the habitable zone around their stars, the not-too-hot, not-too-cold region where liquid water might exist on a planet's surface. One of these planets orbits a star with an effective surface temperature of 5,886 degrees kelvin, very similar to our own Sun, which has a effective surface temperature of 5,778 degrees kelvin. I thought it would be fun to look at the raw data behind this new planet candidate, giving us some insight on how astronomers record and interpret transits. For help, I've been pestering Johanna Teske, an exoplanet researcher at the University of Arizona. She's been kind enough to indulge my many questions, but any misstatements here are surely my own. To begin, let's pull up the planet candidate in NASA's Exoplanet archive. It is designated as Kepler Object of Interest (KOI) 172.02, which tells us something right away: it is one of two planet candidates orbiting this star. If you open the data validation report, you'll see that candidate 172.01 has a period of 13.7 days, shorter than even Mercury, which takes 88 days to make a lap around our Sun. Candidate 172.02, however, has a period of 242.5 days, far closer to our standard Earth year. Its radius is listed as 1.4 Earth radii, making it a "super-Earth." This doesn't mean the planet is necessarily Earth-like in its composition, but it's close in size. That's not to say it isn't Earth-like as well, but as of now we don't know. So where is it? The validation report for KOI 172.02 shows an RA (right ascension) of 19.55072930 hours, and a dec (declination) of 44.86889000 degrees. Those are celestial equatorial coordinates used to find objects in the sky, using the Earth as a reference point. I use the free astronomy program Stellarium to browse the night sky. Stellarium doesn’t like coordinates in decimal form; it wants them in sexagesimal (minutes and seconds). So using a free converter (I used this one, but many others would suffice), we find KOI 172.02 has an RA of 19h 33m 2.62s, and a dec of 44 degrees, 52m, 8.00s. Plugging that into Stellarium’s search function, we find our star nestled in the constellation Cygnus, just below the star Delta Cygni (δ Cyg). 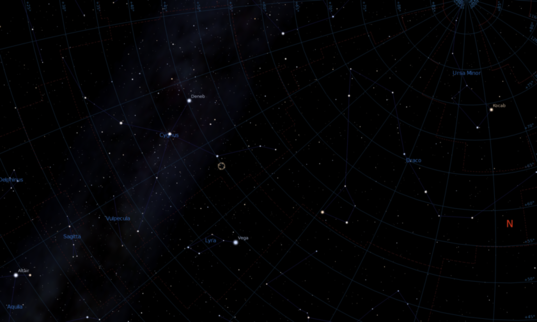 The location of KOI 172.02, a super-Earth exoplanet candidate, in the constellation Cygnus. Using Stellarium, I can see that from my location in Tucson, Ariz., Cygnus is just above the northwest horizon at dusk and sets around 9:00 p.m. MST. It can also be seen shortly before dawn rising in the northeast. 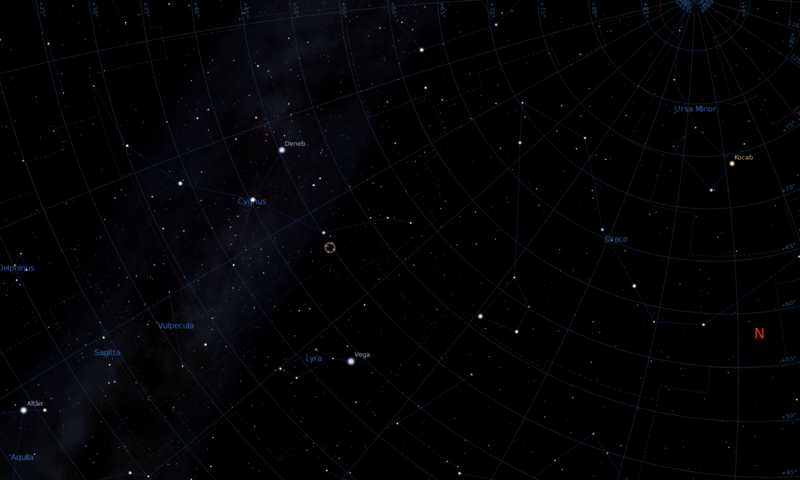 You can set Stellarium to your location to see if you can wave goodnight in the general direction of KOI 172.02. Although, in all likelihood, waving at any portion of the night sky probably means you're waving at some super-Earths, and possible Earth analogues, for that matter. Anyway, let's find out when astronomers will be able to watch KOI 172.02 make another pass in front of its host star. Back on the object page in the Exoplanet Archive, clicking "Transit Service" pulls up a handy calculator. Select an observing site close to you or enter actual observing coordinates (I'll pick Mt. Hopkins, which is closest to me), and click Update. The next transit occurs on May 25, 2013 from 20:52 UTC to May 26, 2013 at 11:45 UTC. You can bet some observatories around the world will be tuned in to watch. Of course, they won't see actually see anything the human eye can directly detect. Planet transits create light curves, where the relative flux is plotted on a graph against time. As the planet crosses its star, it blocks some of the light and the flux drops, rising again when the transit is over. You can see the light curve for 172.02 by clicking on the top Data Validation Summary link (the second link is for the other planet candidate, 172.01). The relative flux of KOI 172.02, as it passed in front of its host star. Exoplanet transits can create these curves in a variety of shapes and sizes. Notice how the relative flux only flattens out for a short period, at the very bottom of the curve, during the middle of the transit. This is due to a phenomenon called limb darkening. When you look at a star -- including our own Sun -- the center of the star appears brighter than the outer edges because the temperature and density decrease as you move outward from the center. If the star had a completely uniform brightness, once the planet was within the star's disk, the bottom of the graph should be completely flat. Depending on the angle from which we see the transit, however, an exoplanet might never be fully within its star's disk. It might graze the top or bottom, which would produce an entirely different graph. Therefore, exoplanet astronomers can ascertain a variety of information about the planet and its host star by looking at these curves. On a final note, you need not be an astronomer to get in on exoplanet hunting with Kepler data. Take a look at Martin Still's Can you find a new planet? article to learn more. Can you tell how far away this star is? I couldn't figure it out from the data on the exoplanet archive. I guessed that maybe Kepler doesn't capture the right kind of data to measure distance, and I didn't know how to look up the star elsewhere. At about 20 hours before main eclipse there is a dip, could that be an exomoon ? You can do an approximate sum, if you pull up the stellar photometry information. The star is slightly hotter and slightly smaller than the Sun, so say it's solar brightness. The photometry gives mag 14 (not sure which band is right but for this purpose they are mostly similar). Sun is absolute mag 5 (ie brightness at 10 parsecs), so the difference is 9 mags, or a factor of 4000, and distance ratio is square root of this, or about 60. So 600 parsecs, or 2000 ly. Hi, Darin Ragozzine, chiming in here from the former* Kepler Team. A couple of notes on the main article before responding to some of the comments. First, thanks for pointing out what the raw data looks like! I think this is a great article to point out to people what's going on behind the scenes and that it's all actually rather accessible if they are interested. Thank you also for being careful to refer to this object as a "candidate" instead of a "planet"... we're not sure yet if it is a real planet, though there's no evidence to suggest that it's not. While it is true that the ".02" modifier means that it's the second known Kepler planet candidate around the star KOI-172, there are a few things this doesn't mean. It doesn't necessarily mean that there are only 2 candidates in this system, though that is true in this case. It also doesn't mean that there aren't more transiting planets: there easily could be, but they have signals too low to be detected by Kepler. Finally, there could be (and probably are) non-transiting planets as well. This is a great case where absence of evidence is not evidence of absence. Another important thing to remember is that the radii on these candidates are not well known. The radius is determined by comparing using much light is blocked (you can see from the plot that this is about 0.0003) along with an *estimate* for the radius of the star, in order to infer the size of the planet. In this case, the Exoplanet Archive table lists the "Stellar Parameter Provenance" as "Pinsonneault", refering to a paper by Marc Pinsonneault that estimates the stellar properties by using the colors from the "Kepler Input Catalog" or KIC. These parameters are highly uncertain... additional (spectroscopic) analysis of the star is needed to confirm them. This is why the radius of the planet is listed as 1.54 +/- 0.42 Earth radii. And while it is not common, sometimes the KIC stellar radii estimates are *way* off because different kinds of stars are sometimes the same color but also because the light could be blended from one or more stars. KOI-172.02, if a planet, could easily be a bigger than Kepler-22b in radius. Finally, knowing the radius does not tell you what the planet is made of... it could be a warm solid planet with lush forests, but it could also be a miniature version of Neptune: all atmosphere and nowhere for life. The lack of spectroscopic follow-up is also why there is no known stellar distance. Stellar distances are notoriously difficult to determine and cannot be estimated without additional study. Frankly, the distance doesn't have much meaning, unless you're planning on flying there. Though it is fun to think about, Kepler is not built to find the nearest potentially habitable planets (for that you need an all-sky search like the proposed TESS mission), so none of these planets will ever be candidates for interstellar travel. Certainly the community will be interested in following up these and other interesting planets. Concerning exomoons, there is a group led by David Kipping who are leading the search for such objects. They also reported at AAS and have a superb paper submitted describing their search so far (http://arxiv.org/abs/1301.1853). The short version is that they have a rigorous and powerful infrastructure in place and that searching the most likely candidates for exomoons did not show any candidates. Look at these light curves long enough (please do!) and you'll see lots of little dips. These are usually statistical fluctuations that are just random noise, like occasionally rolling two dice and getting a 12. The dip at +18 hours looks much stronger to me than the dip at -22, which is an example that we're just seeing random variations. (Also, this is a "phased" light curve, meaning that it is multiple transits all shown together: exomoons move around and won't phase up in such a plot... one reason they are very hard to find.) *I mention that I was on the "former" Kepler Team, since now there isn't a well-defined Science Team like there was during the nominal mission. In the extended mission, scientists continue to participate as part of sanctioned "Working Groups" that are now open to interested scientists. Very fun to see all the newest Kepler results and the excitement they generate. Jason - Thanks for the great article. Darin - Thanks for adding to it. This is what the TPS is about. FYI to all & others -- "straightening out" the PARSEC approx. equals 3.26 LY (rounded). If I remember correctly the acronym PARSEC is Parallel ARc SEConds. Great article and additions. To me, the shape of the red line when the dip begins is not symmetrical with its shape when the dip ends. Could this indicate an exomoon? How many transits were used to compile this light curve? Would the start of the curve dip be *noticeably* more symmetrical to the end of the curve dip, or less symmetrical, if data from one (or even one-half) of the multiple transits were discarded? Darin, thank you for the info, very enlightning, but what would a double planet look like and would it be easier to spot? One other question, has there been any study of hot Jupiter's that migrated into its sun, then what would happen to its satellites? It would be interesting to see a computer simulations of the orbits that the satellites have, if they survived. 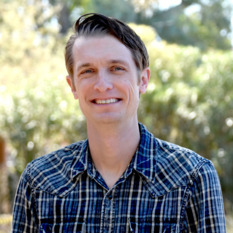 FYI: Another blog on exoplanets from the AAS meeting that this blog adds to in its own way is titled "Report from AAS: Exoplanets (and exo-asteroids, and exo-comets) everywhere" Posted By Emily Lakdawalla. Glad people found my comments useful. A couple of quick responses. The "scatter" of black points are all the individual measurements (sorry, I'm not sure exactly how many transits are folded here) and the thicker blue points are "binned" versions that have less noise. As long as the red line is mostly within the black points, then there's almost certainly nothing going on except for noise. The candidate is real (imagine how bad it would look if the red line were straight), but any other dip or asymmetry is just your eye searching for a signal within the noise. Searching for exomoons is intense business, because they are likely to have tiny barely detectable signals that are constantly moving around. If you don't believe me, look up the paper I referenced (which is just one in a series of several); Kipping and his colleagues are doing an extra rigorous job hunting for these moons. I don't mean to discourage anyone from looking at the light curves and saying "hey, what's that?" I love that you're looking at real data and if you enjoy it to, go over to planethunters. Although looking for dips is one of their main goals, argubly more important is the "talk" portion of the site where amateurs and the occasional professional discuss in detail dips, asymmetries, and anything else interesting about the light curve. Double planets (another way of imagining a world with a very large "moon") have not been seen. Of the thousands of planet transits that we've looked at, we can tell that double-planet like objects are certainly extremely rare. In fact, even though Kepler has revolutionary precision, finding exomoons is going to be very difficult... they're just too small. The biggest moon in our solar system is Ganymede, which would only be detectable around a handful of very bright Kepler stars. But the probability of observing a Jovian-type planet is also very low; the combination of these difficulties and the fact that moon mass probably scales with planet mass suggests that we will find about 0 exomoons. That is, unless there are some other exomoon formation mechanisms that don't operate in our solar system in the same way, which is certainly possible. I like MikeFid's question about what happens to moons of planets that get swallowed by their stars (though we're still not sure how often this happens, if at all). Dynamically, moons can't handle the cramped space inherent in hot Jupiter systems (Barnes & O'Brien 2002) and would tidally decay into their planets or be disrupted and collide with their stars. Getting closer in does not help! Even if moons happened to escape, they're on unstable orbits and will eventually hit the star. If Jupiter can easily push asteroids into the Sun, this is inevitable in systems that are 100+ times more compact. Hope this helps. Thanks David and Darin for the follow-up on the distance. I hadn't thought much about how distances to stars were estimated. Darin, My big hope is that in the cases where radial-velocity (which Kepler does not do, of course) has found an exo-jovian in the habitable zone and a terrestrial hugging the star, they will take another long, hard look at that data, so they don't miss a potential exo-terrestrial. I, of course, do not know the particulars involved, but it seems to me that such a situation could be hiding several exo-terrestrials.